Based in the cool-climate Mornington Peninsula, 80km south of Melbourne, winemaker Sandro Mosele has crafted a reputation for the very best representation of Australian Pinot and Chardonnay. The Mornington Perninsula is 60 km southeast of Melbourne, Victoria. The Peninsula features an undulating ridge system, which receives considerable rainfall throughout the year. The soils vary from rich red clays, to lighter sandy loams depending on location. 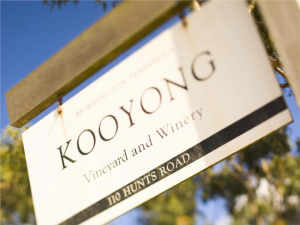 Kooyong's location was selected specifically to suit production of Pinot Noir and Chardonnay grape varieties.Kooyong lays claim to 52 acres of Pinot Noir and 27 acres of Chardonnay vines. Kooyong strives for complexity in its wines by exercising 8 different clones of Pinot and 10 clones of Chardonnay. Each clone has its own inherent characteristic. When blended together, they give the wine its many flavors and textures. The vineyard is split into five individual parcels with a variety of clones planted on some very different soils, and everything is done to enhance and express the natural characteristics of each parcel. The best section of each vineyard is reserved for the Single Vineyard wines. The remaining parcels are then blended to produce Massale Pinot Noir and the Clonale Chardonnay. Kooyong and sister estate, Port Philip, were James Halliday?s Wineries of the Year in 2012. Anthony Rose commented in Decanter Magzine ( 2010) that "This set of Victorian wines would blow a range of Burgundies out of the water. They?d rank up there with some premier cru C?tes de Beaunes."